Here is our LONG overdue Forbidden Island board game review! If you’ve read our Pandemic review or our Forbidden Desert review, then you know that we are big fans of Matt Leacock’s games. Did we like Forbidden Island as much as those two, though? Keep reading to find out! 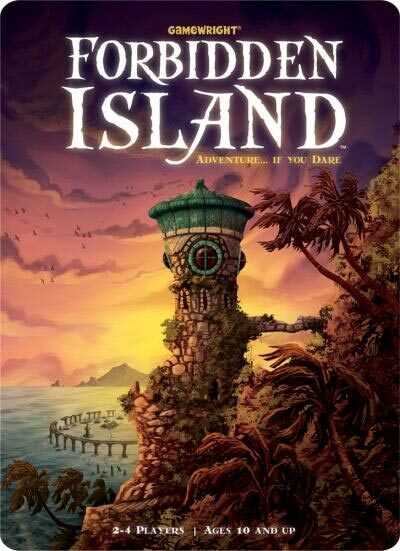 Forbidden Island is a cooperative adventure game designed by Matt Leacock and published by Gamewright. Two to four players take on the roles of different adventurers who move throughout an island of mystery looking for lost treasures. The island is not stable and is slowly sinking, though, so the players need to get the treasures and get away quickly as possible. Players can choose from one of six different roles in Forbidden Island. Each one has its own unique abilities, which can change the players’ strategies throughout the game. The board itself is made up of 24 island tiles. Some of the tiles have treasure symbols on them, and players must go to these tiles to get the treasure when they have enough treasure cards of that type. Each turn, players can use their three actions to move, shore up (flip) flooded tiles, or share cards. Players will also be able to use certain action cards that allow them to get helicopter rides to different parts of the island (Helicopter Lifts) or shore up any tiles (Sandbags). Once a player has completed their turn, they take two cards from the treasure deck and add them to their hand. They then look at the current water level and draw that many cards from the flood deck. Tiles are either flooded or they sink when their flood cards are drawn. If a player gets a Waters Rise card from the treasure deck, they have to follow the directions on the card. If a tile is flooded and the corresponding card is drawn, the tile has been considered sunk and it is removed from the game. If a player is on a sunken tile, they must move to a new tile. If they cannot move, they drown and the game is lost. The players lose if the Fools’ Landing tile sinks, a player drowns or they lose the ability to collect one of the treasures. The game is also lost if the water level reaches the Skull and Crossbones level. The only way to beat Forbidden Island is if all four treasures are collected, the players make it to Fool’s Landing, and one player discards a helicopter card. Learning how to play Forbidden Island is about as simple as it gets when it comes to cooperative board games. Just about anyone can learn the Forbidden Island rules in 10 minutes, which makes it an excellent game for beginners and for families. Forbidden Island is an adventure game, and it does a pretty good job of simulating an adventure on an island. The tiles are well made and have nice artwork on them, and the way that adventurers move throughout the island definitely works thematically. Forbidden Island also has great replay value. You randomize how the tiles are set up each time you play, so it is a different challenge every time. There isn’t a Forbidden Island expansion (yet), but there are different tile layouts that can be downloaded to add even more variance to the game. We also really like that most games of Forbidden Island go down to the wire. You’ll have an easy game here, a nearly impossible game there, but for the most part you can expect to face an excellent challenge whenever this hits the table. Forbidden Island is a gateway game through and through, so people who have played (and understood) more complex cooperative board games might find this one to be quite light. It’s not an easy game by any means, but it doesn’t have much meat on the bone, either. As is the case with some other cooperative games, alpha gamers can take over while playing Forbidden Island. This means that one player can start to tell everyone else what to do, which can be frustrating when you want everyone to work together as equals. Even though this is a Forbidden Island board game review, we felt like we needed to add this section. Many people who are looking for a nice and quick cooperative game will end up deciding between Forbidden Island and Forbidden Desert. The games are quite similar, but Forbidden Desert is a little bit more complex. Players take similar actions and have similar roles in both games, but Forbidden Desert has an added mechanic where locations and sand is moved around the desert as the storm moves. This is another thing for players to think about, so it can cause a bit of confusion early on if you aren’t used to these types of games. You really can’t go wrong with Forbidden Island or Forbidden Desert, but Forbidden Island might be slightly easier to grasp for beginners. Take a look at our Forbidden Desert board game review for a more detailed explanation of the game. Forbidden Island has been one of the most popular cooperative board games since it was released, and for good reason. It’s easily one of our favorite cooperative board games for families and will continue to hit the table for years to come. If you are looking for a solid co-op board game for beginners, or if you just want a great little adventure game that the whole family can enjoy, you really can’t go wrong with Forbidden Island. It’s inexpensive, challenging, and a whole lot of fun! If you want to test out the game, be sure to download the Forbidden Island app for iOS. Thanks for taking the time to read our Forbidden Island board game review!